Gilgamesh subduing a lion who was probably minding its own business. I decided Gilgamesh deserves his own post. It helps to get a handle on a culture by looking at its heroes and stories. Gilgamesh the king was an actual historical figure. Gilgamesh the hero of the epic was two-thirds divine and one-third mortal. So Gilgamesh and Enkidu meet, wrestle, become best buds. They defeat the awful giant Humbaba. The goddess Ishtar proposes marriage to Gilgamesh—when he turns her down she sics the Bull of Heaven on him and Gilgamesh and Enkidu defeat him, too. When Enkidu dies, Gilgamesh works out his grief by searching for the meaning of life and the source of immortality. 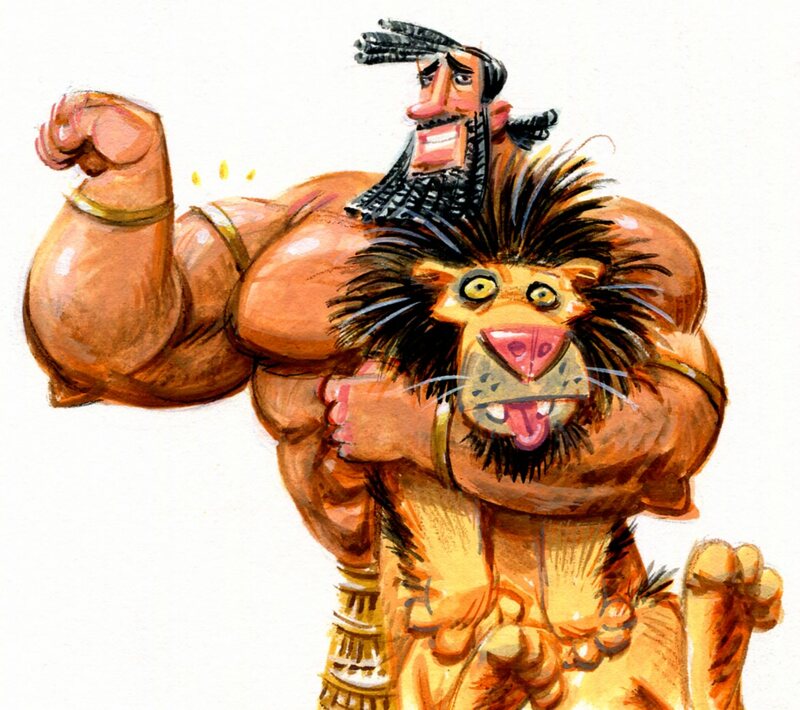 I taught a unit on Gilgamesh to high-schoolers in Sunday school, just because there are so many echoes of Bible stories in Gilgamesh, particularly in Genesis. There’s a Great Flood; a guy who survives the flood by loading his family and animals into a big boat; a plant that holds the essence of Life (with a treacherous serpent hanging around nearby); Enkidu is a hairy strongman who is tamed by a seductress and loses his hair. My point in teaching Gilgamesh wasn’t to diminish the Bible stories, but to show how the Bible stories grew from a tradition of ancient MidEast literature into a narrative that tells the story of all us mortals, not just divine, semi-divine and immortal characters. The Bible is a radical departure from that tradition. We get Gilgamesh from pieces of clay tablets that have survived through the ages. A library fire, which would mean a disastrous loss of literature today, actually preserved many ancient books by firing the clay they were written on. Gilgamesh is a fun read, although there are adults themes in there, so be warned. Hey, gang—if you live anywhere near Long Beach Island, New Jersey, I’ll be at the public library in Surf City this Saturday morning at 11:00. Come over and say hello! I’ll read stories and paint whatever everyone tells me to. Heave on your futtock-shrouds and don’t leave your swashes unbuckled! ‘Tis International Talk Like a Pirate Day! Don’t forget: If you are anywhere near Latrobe, Pennsylvania, shape a course for The Art Center (819 Ligonier Street) where I’ll talk about illustrating pirates this evening from 6:30 – 8:30. If you miss it, I’ll be at The Art Center again tomorrow morning 10:00 – 11:00ish (we need to clear the decks before noon—when some poor lubber’s wedding takes place). First row: Johnny Depp as Captain Jack Sparrow in Pirates of the Carribean (2006). Second row: (left to right) Douglas Fairbanks in The Black Pirate (1926); Robert Newton as Long John Silver in Treasure Island (1950); Sherman the parrot; Errol Flynn as Captain Blood (1935). 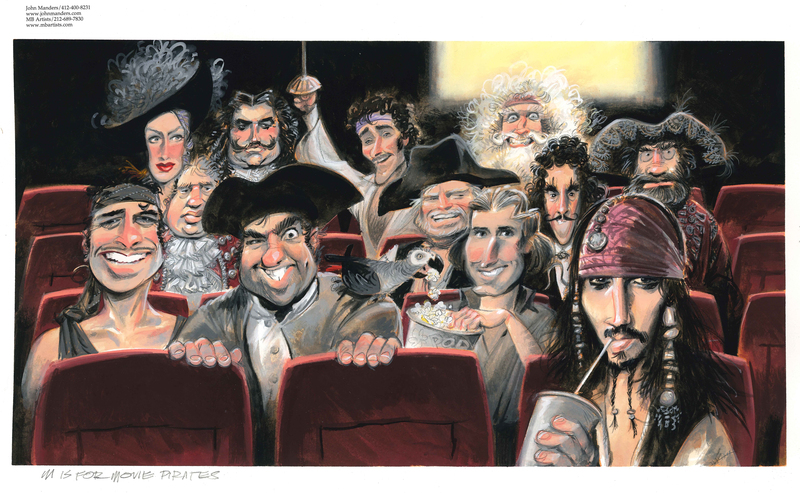 Third row: Charles Laughton as Captain Kidd (1945); (Charlton Heston as Long John Silver in Treasure Island (1990); Dustin Hoffman as Hook (1991); Walter Matthau as Captain Red in Pirates (1986). Fourth row: Maureen O’Hara as Prudence ‘Spitfire’ Stevens in Against All Flags (1952); Laird Cregar as Sir Henry Morgan in The Black Swan (1942); Kevin Kline as the Pirate King in The Pirates of Penzance (1983); Graham Chapman as Yellowbeard (1983). 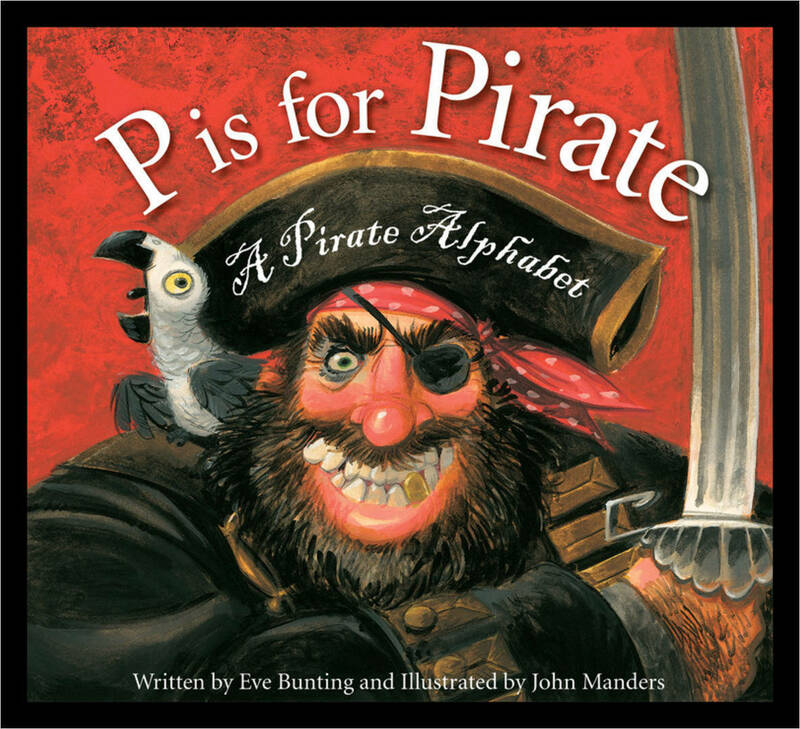 More from P is for Pirate as we count down to Talk Like a Pirate Day, September 19th! I’ll be presenting a pirate program at Adams Memorial Library in Latrobe, PA, Friday & Saturday September 19th & 20th. Here is D is for Davy Jones from sketch to final painting. Sorry about the color in my progress shots—must’ve been at night and I forgot to switch the flash on. You can see I based my version of Davy Jones on an 1892 ink drawing by John Tenniel from the British humor magazine, Punch. Tenniel is the guy who drew the famous illustrations for Alice In Wonderland. Thank you, Claire Kirsch, for your fine reportage on my recent visit to Penns Manor Elementary and my collaboration with the students to create the horrible & dreadful Baby Pandasaurus Rex! Read all about it here. As I mentioned yesterday, Target offers grant money to schools and organizations who need help with an early reading program. An early reading program might entail hiring a children’s book author/illustrator to present to students (he said rather shamelessly). Dollar General also has a grant program for early literacy/youth development—as does Barbara Bush, Verizon, Scripps-Howard, and Clorox. Here is a round-up of foundations who offer grant money for summer reading programs. Here are awards & grants available from the International Reading Association. If you would like a detailed description of my presentations to help you apply for these grants, be sure to give me a yell! An interesting little article about a real-life Clarence the Copy Cat—although this kitty seems to enjoy his de-mousing duties. Illustrator Kelly Light writes a thoughtful essay about encouraging kids to read. And how do you do that, without making it seem like an obligation? She has a daughter, so her recommended reading is girl-oriented. I should get myself together and compile a list of the boy-oriented books that shaped my childhood. I’m lucky—I come from a family who reads for pleasure. My dad used to take me along on his trips to the old public library in downtown Syracuse, New York. This was one of Andy Carnegie’s beautiful libraries—in the 70s, the boneheaded decision was taken to move the books into a mall. The building is still there, but it’s offices now. I could take you on a tour of that dear old place—from the bust of Marconi on the right as you entered, up the worn marble stairs to the plate-glass floors on the second storey. The children’s books were on the first floor in the back. It had tall windows and ceilings, and blue carpet. That’s where I first read Yertle the Turtle. Anyway, give Kelly’s post a read. Here’s a wonderful story about some overdue library books, and how the anonymous borrower redeemed his/her honor 50 years later.